It took me much, much longer than it might seem, mainly because of my lack of experience with the program, but I can finally proudly present to you my first KNP game ever completed - Storm Is Coming. 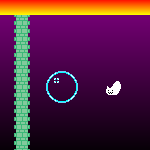 It is a somewhat artsy one screen platform game which should take you about 5 minutes to complete. If you know what to do...if not, there are hints available. I know there will be some mistakes and logical gaps, but what the hell. I think it's decent for a debut. 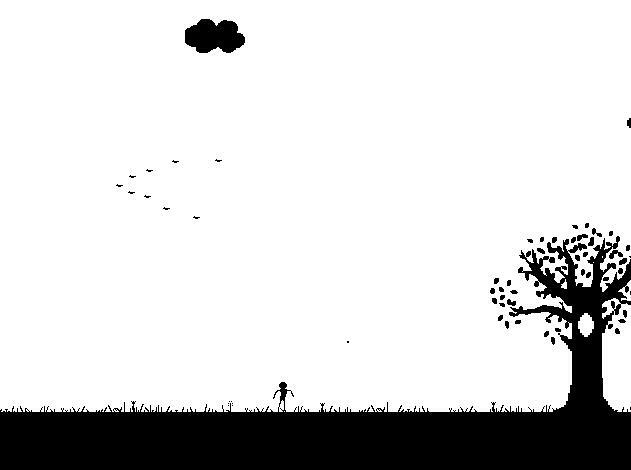 It is black and white with home-made sprites, crappy animations and the soundtrack is me plinking away on a detuned piano. Yeah, sorry about that. Tell me what you think, I would like an experts' opinion on what I could work on in future projects. Greetings to all fellow locomotive engineers! and good! I was able to reach one ending using the hints, no idea on how the get the other. I like the birds and flies and worm(s) moving around in the scene. I got both endings. I really liked the music. I look forward to more games from you. Congratulations! Did you need the hints, or figured it all out by yourself? More games on the way!